Man, this has been a mixed bag of a week. There have been some real high points, like the successful Three Speed Ride on Sunday and the rough stuff ride through Forest Park on Monday. And then the lowest of the low: finding out on Thursday that the frame of my Raleigh Wayfarer was broken. I knew I needed to have something good to balance things out. And what better "good" than a simple bike ride? The weather on Friday was awesome: after a chilly start, the high peaked near 60F/16C and the sun shone brilliantly. I worked until 3 so I had a few hours of daylight to play with. Mount Tabor? Tabor is always good, but it's easy and I have already been there this week. How about Rocky Butte then? Rocky Butte is one of my favorite, special places. But I don't go there enough because it's just far enough out of my regular range. 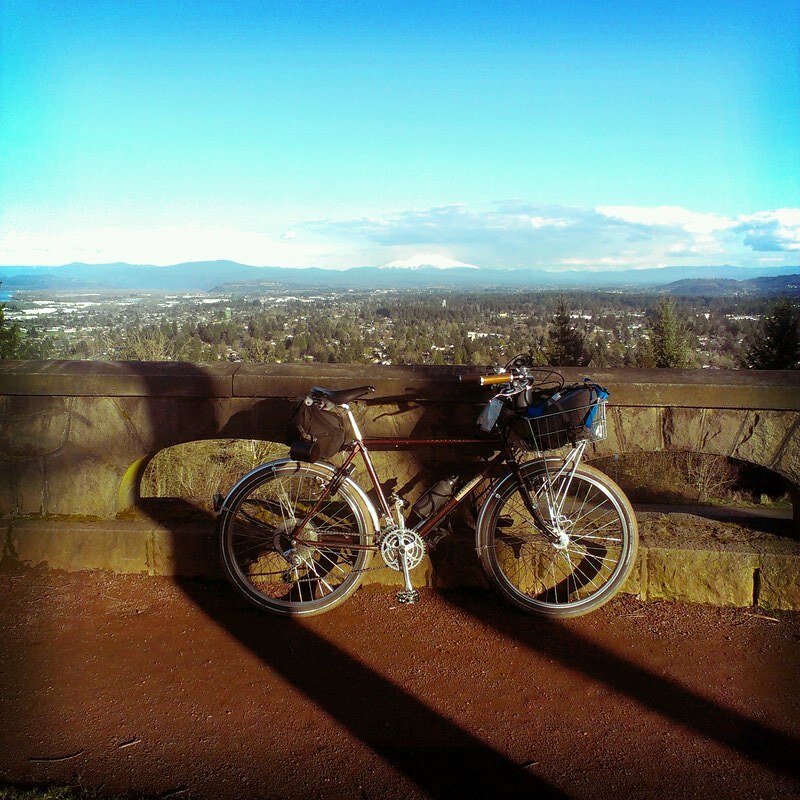 Heading up to Tabor on any given day is pretty easy, Rocky Butte takes some effort. Maybe that's what makes it all the more special? So soon after work I found myself rolling over familiar streets on the way through NE up to Rocky Butte. Rocky Butte lies just east of NE 82nd Avenue and south of Sandy, so it's on the "edge" of pre-war Portland. Like Tabor, Rocky is an extinct volcanic cinder cone, slightly lower than its sister (Tabor at 650ft/200m, Rocky at 612ft/187 m.) Like Tabor, Rocky Butte has quite the prominence over its surroundings. But there are differences. 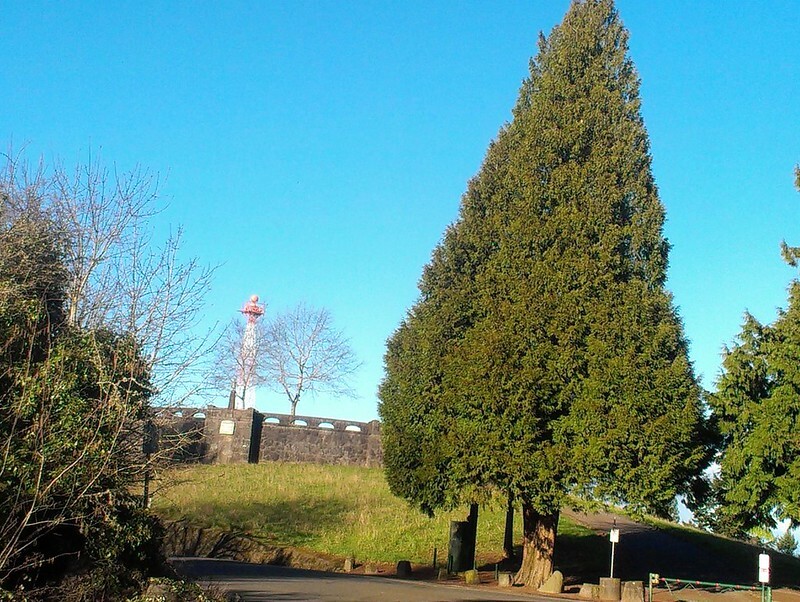 Tabor has been preserved as a park for over 100 years and as one of Portland's pre-eminent parks, is loaded with features and trails. Rocky Butte has a small park at the top (Joseph Wood Hill) and while its slopes are mostly wooded and owned by various government agencies, there are but a few primitive unmarked trails running through them. 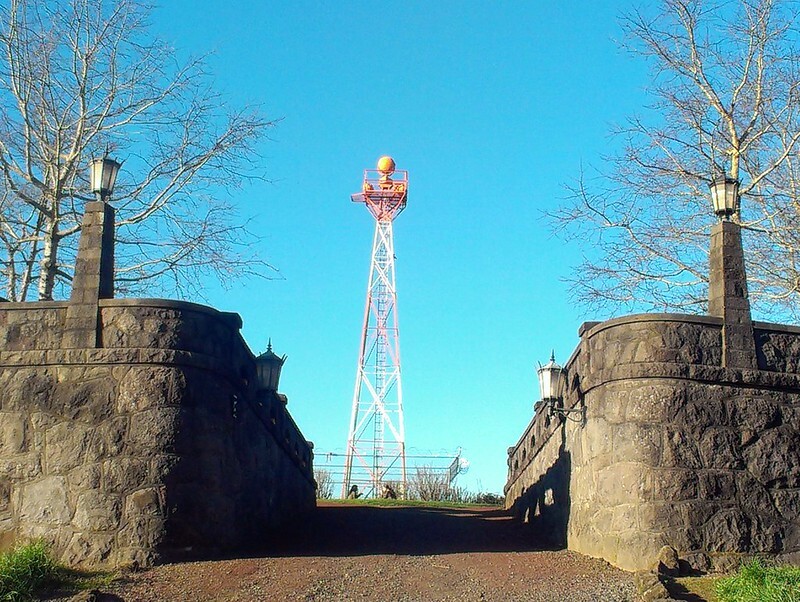 Mount Tabor has many access points from the streets running around it, Rocky Butte has only two: a road running from the north and one from the south. As I have done nine out of ten times, I chose the north road as my way of getting to the top. It passes by a few homes and a Bible school, then starts its steep ascent, the first part maybe 8% then mellowing out a bit to maybe 6%. This area wasn't developed until around the Depression. There had been plans before it to build a road to the top in the hopes of adding a scenic stop to the then new Columbia River Highway, but it took the make-work programs of the New Deal to get it done. The two roads to the top were built during this era, when scores of young men in the Civilian Conservation Corps were put to work grading the highway and, more importantly, building the beautiful stone retaining walls by hand. These walls reminded me of this era, and the grind up the hill also reminded me this was the first time riding the Crested Butte up here. 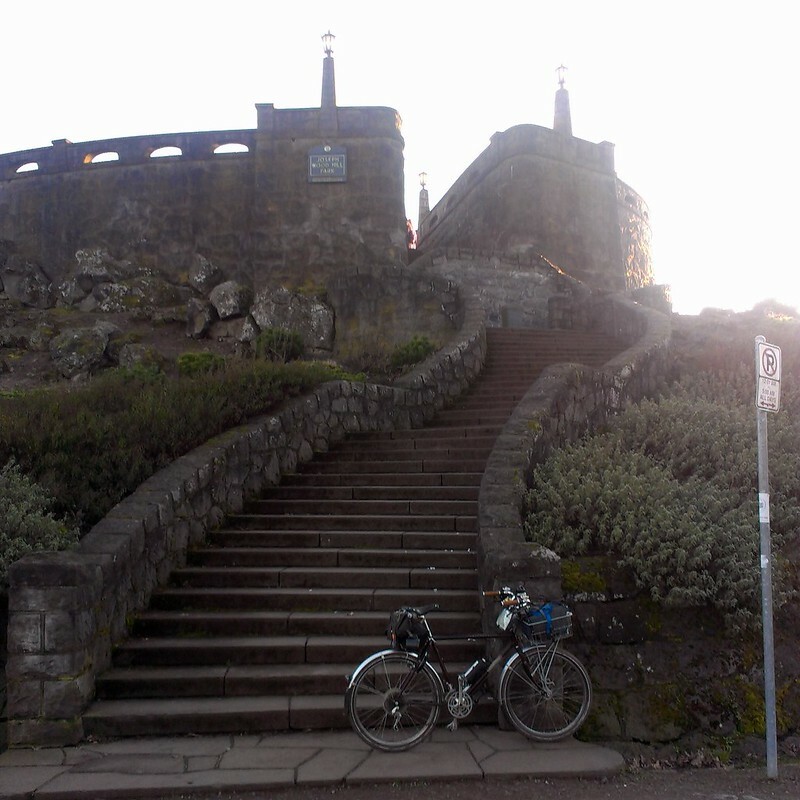 I've ridden most of my other bikes to the top over the years, as its always a good test of a bike's climbing abilities. The Crested Butte didn't disappoint, its low gears working like they should. Mount Hood in the distance. Soon I was at the top. This is where the biggest difference between Rocky Butte and Mount Tabor become painfully evident. While there are some good views to be had from Tabor, it doesn't compare with the wide open expanse at the castle-like, hand hewn walled structure atop Rocky Butte. This "castle" offers an almost 360 degree view of the surroundings. 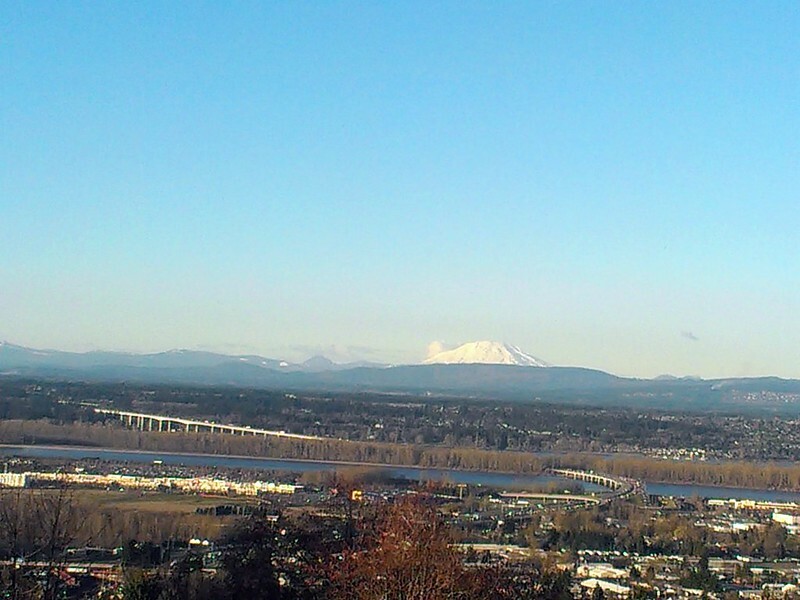 You can see it all from up here: snow capped mountains like St. Helens and Hood, the start of the Columbia River Gorge, Gresham, Vancouver, Portland, and other small cities, and the mighty Columbia itself. Speaking of the mouth of the Gorge, I had always wondered whether or not that small speck in the distance was the Vista House at Crown Point. And then I remembered that I have my small binoculars on me, so I pulled it out to confirm, yep, it's the Vista House! 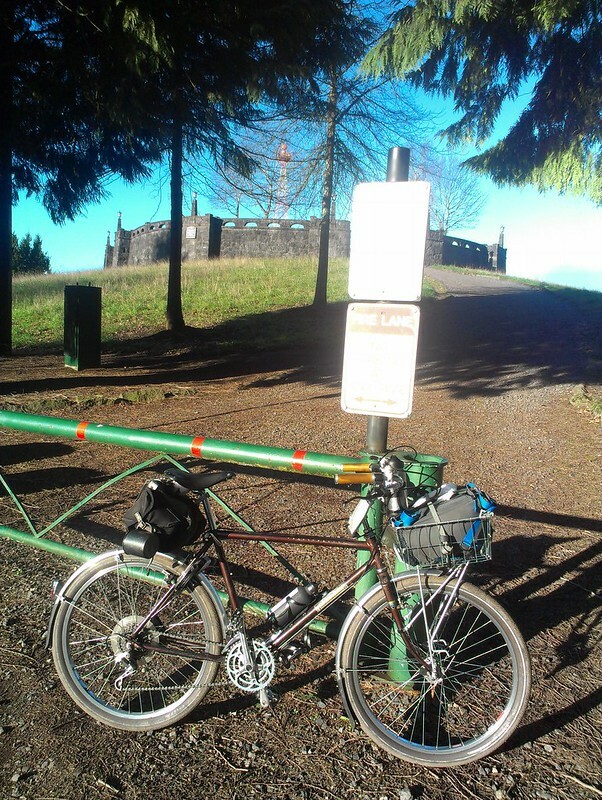 The top of Rocky Butte was busy, as it is when it's nice out. I saw a whole wedding party get photographed up there! I spent maybe a half-hour up top and then decided to take off. And like nine out of ten times, I descended the butte by taking the south road. 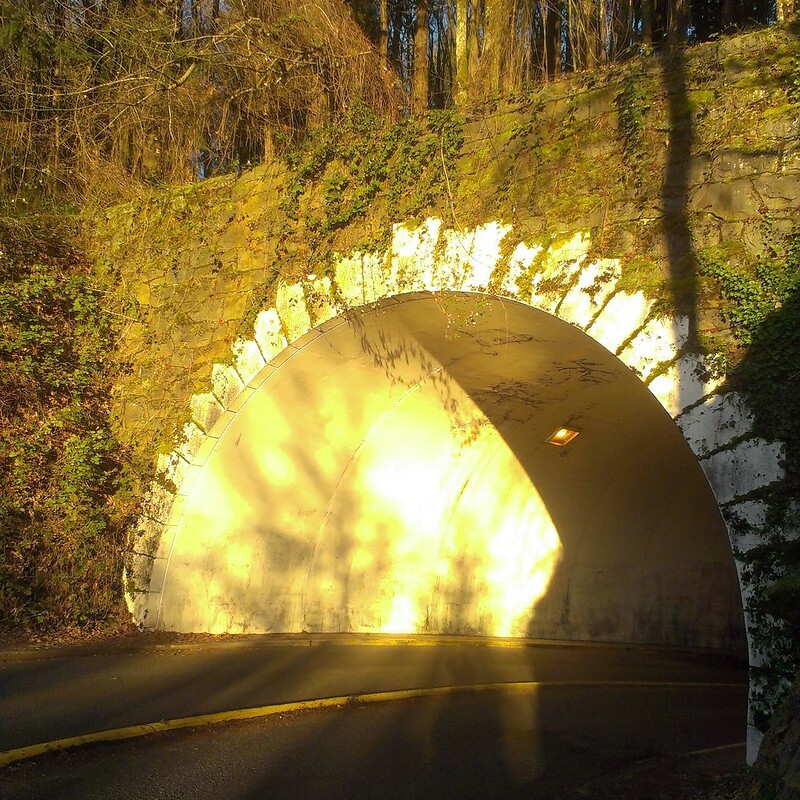 There is a good reason why: on the south road is one of my favorite secret spots in all of Portland: The Rocky Butte Tunnel. 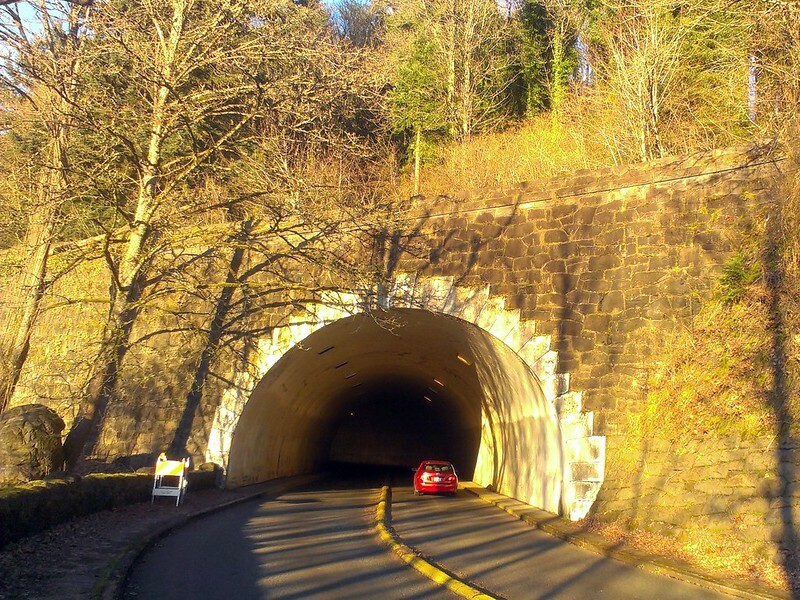 When they built the road in the 1930's, the road engineers decided that the best way to deal with a hairpin turn was by building a curved tunnel, a tunnel that wrapped round underneath itself. A vehicle travelling from the top of the hill will enter this curved tunnel, complete a 270 degree turn rightward, and exit the tunnel underneath from where they started! The top of the tunnel. Even though I've been through the tunnel scads of times over the years, this was the first time I ever decided to stop and take a photo of it. Maybe because every other time I was enjoying the thrilling descent a tad too much? And just like that I was at the base of Rocky Butte. The sun was starting to set, and I hit the high road home. A fitting and high end to such a mixed week. Funny, I would ascend, nine times out of ten, in the opposite direction! For some reason the grade was easier (for me) that way. 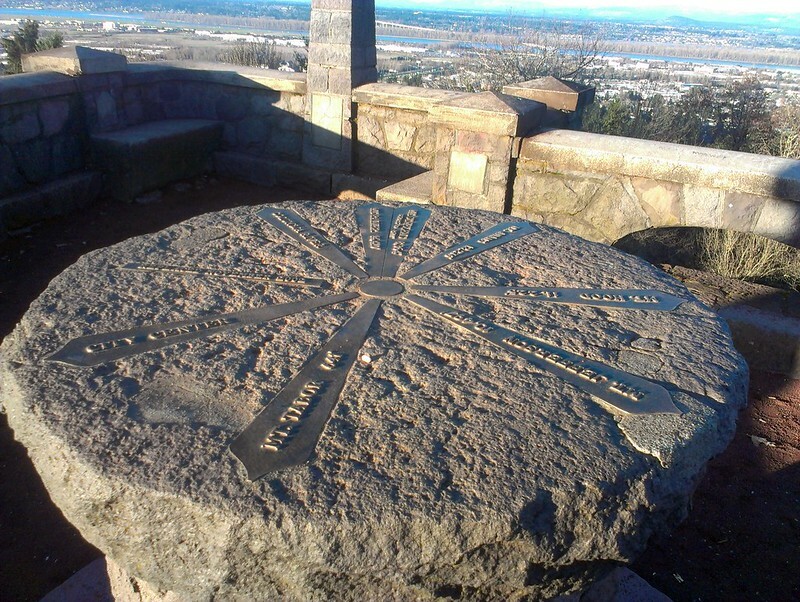 Rocky Butte is a spectacular point to view the city and surroundings. By far my favorite was checking out Mount Saint Helens. Is it just coincidence that I now own a bike of same name? Actually, when I spied this bike in a neighbor's garage sale, I just had to have it. Thanks for sharing the panoramas that I miss so much. I get up to Portland once in a great while and now I have seen a road trek that I am going to have to travel!